Does a small head make one modest? Shortly after Evelyn’s birth, we were told by the hospital paediatrician that she had a small anterior fontantelle. This, apparently, was nothing to be overly worried about, but we should keep an eye on it. Accordingly, it has been checked by her child health nurse at each appointment. On Wednesday, at her four-month check-up, the nurse mentioned that the fontanelle is now worryingly small and we need to get an ultrasound to have it checked out. 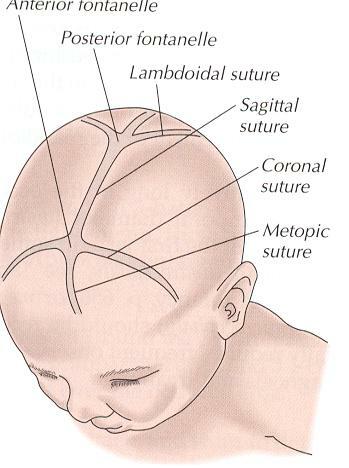 The anterior fontantelle is one of many soft spots in a baby’s skull which exist to allow the skull to grow and expand. If the spot is too small, the concern is that it may be closing, or ‘fusing’, too early. If that happened, the skull may not grow, and therefore of course the brain could not grow. I’ve been assured that the chances of this small fontanelle really being a big problem are really very small. But it does need to be checked, just in case. So I now have a referral from my GP to get an ultrasound, and the results of that will determine our next course of action. I’ll keep you updated!